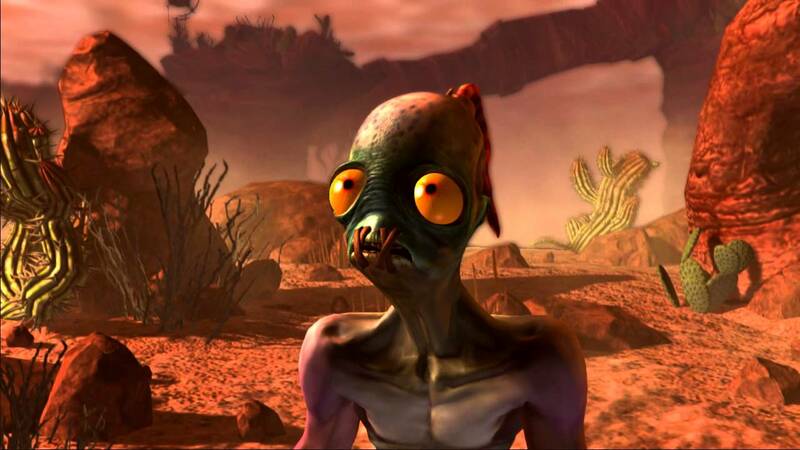 Oddworld: Abe’s Odyssey was, when it came out, the kind of game with a unique enough style and setting that it became instantly memorable. From this it situated itself as one of the late 90’s best adventure-platformers. Its basic control system, its simplistic design, and its relatively straightforward story hooked people and certainly charmed them to the point where it merited several sequels (both good and bad). But is nostalgia enough of a reason to revisit this gaming classic? What, exactly, would happen if Abe’s Odyssey came out today? In fact, Abe’s Odyssey translates to the modern era quite well. 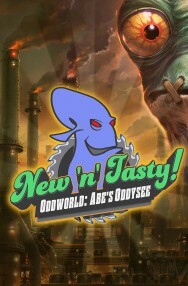 The developers Just Add Water and the publisher Oddworld Inhabitants, after a long hiatus, bring us back to their strange little world with Oddworld: New ‘n’ Tasty. It is hard to straddle the line between progress and nostalgia when it comes to a remake. On one hand, a developer is well aware that gaming audiences have changed since 1997. They rarely play 2D platformers, let alone adventure games. More than that, Oddworld is the kind of franchise which, today, may not be palatable to the modern sensibilities. It’s a little too weird. On the other hand, however, Abe’s Odyssey is a known classic and therefore has a nostalgic sentiment working in its favor. Older and more traditional gamers remember it fondly. As a result, remaking a game like this requires much care and precision to create an experience that both newcomers and experienced fans alike will enjoy. 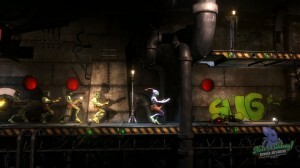 The core of Oddworld: New ‘n’ Tasty is practically the same as Abe’s Odyssey. You are still playing as Abe on his journey to liberate the Mudokons from their oppressed, enslaved work environment. Much like the classic novel The Jungle, you are a meatpacker working in hellish conditions. Your goal is to free as many slaves as possible before reaching the end. The more slaves you free, the better your ending and also the more fulfilled you can feel on your odyssey. At first—unless, of course. you are already a fan—you might not care at all for New ‘n’ Tasty. This game is obviously bizarre and it runs on an old-school gameplay model. But after you try it out, you might be surprised by how well this style of gameplay holds up. It’s relatively precise and there’s enough in the environmental design to give you cause you try out a few ways to set your fellow workers free. The enemies and environments are diverse enough to keep you from feeling any sort of dull repetition. As Abe you have several different moves, but they are all very basic. You can sneak, you can run, you can roll (and other similar things). While this may sound perhaps too simple by comparison to modern games, it’s actually a welcome return to form to the days gone by. You won’t feel as if it’s boring as a result, because the environments require some measure of precision to aptly escape danger and liberate your fellow slaves. You do not have to free everyone if you do not want to. In fact, you’ll often find it’s much easier not to. Saving everyone is not an easy task and will require a lot of care. 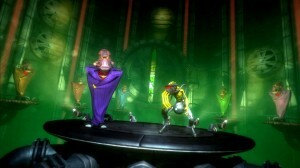 In order to lead them out of harm’s way Abe must issue vocal commands, such as “follow me” or “wait” and eventually get them to a portal where they can escape. To open the portal, Abe does a chant which creates an extra-dimensional rift and grants the other Mudokons safe passage. It’s very cool looking. 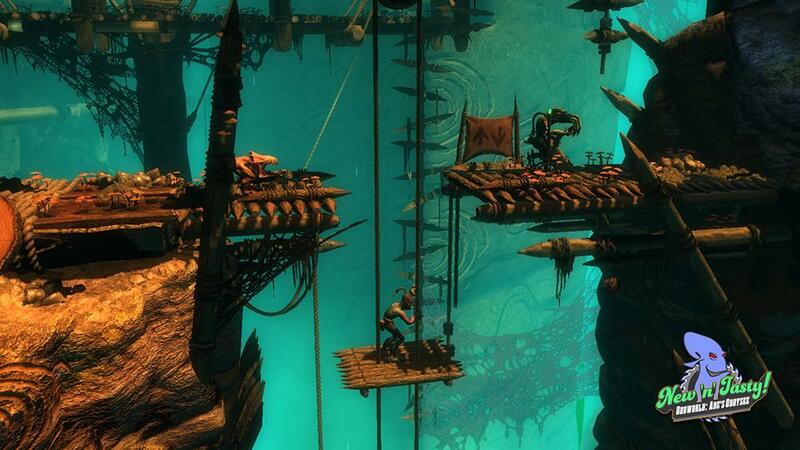 Technically speaking, Abe’s Odyssey has never looked or played better than it has in New ‘n’ Tasty. That much is obvious. The visuals are outstanding for a 2D platformer and the environments look fresh and exciting. It comes to life in a way that replaying the original game never could given its age and the fact it is on dated platforms. It has been a long time since 1997 and this technical update, at the very least, is a welcome change. But does any of that make it worth your time or your hard earned money? It’s a game you can download from the network stores, but unlike other games of its kind, it’s nearly double their price. At $29.99, this is practically a full-priced game. Indeed, while there is a lot of content and it is a very well made game, it certainly cannot be forgotten this a remake of an old game that will likely appeal to fans first and newcomers second. Even with this in mind, it’s an easy game to recommend for several reasons. Abe is a charming character, the environments and gameplay are well designed and also hold up by comparison to other games on the market, and it has a really good storyline. New ‘n’ Tasty is not quite as revolutionary in 2014 as Abe’s Odyssey was in 1997, but it’s still an excellent title with a lot to offer. If you are running out of games to play via the network, or you are just looking for something which that nostalgic appeal, you won’t do much better than the new Oddworld. It’s a blast… from the past. A review code for the PS4 version was provided by the publisher.